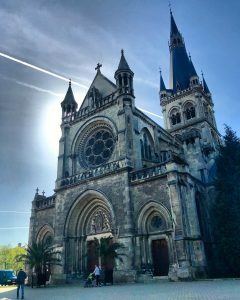 Epernay, the capital of Champagne. As we drove through the streets we saw all the big names in the champagne world. I called them out one at a time. Names, darling, names. This is a city that’s not only been made prosperous by champagne, it’s built on it. Literally. 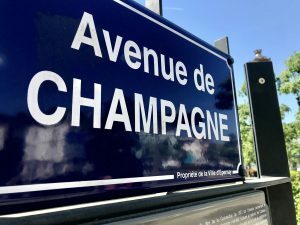 Under these streets, under the carparks, the buildings, the shops, is over 100kms of tunnels holding hundreds of millions of bottles of champagne – much of it the best champagne in the world. They say that this is the most expensive real estate in the world – not just for what’s on top, but also for what’s held below. This boulevarde positively fizzes – with both the bubbly stuff and with history. Napoleon walked these streets and he and his entourage stayed here as a stopover of sorts on their way to and from various battlefields. I drink champagne when I win, to celebrate … and I drink champagne when I lose, to console myself.” – Napoleon. Of course, that was back in the day when only royalty and generals could afford to drink champagne. Bottling hadn’t yet been invented, so only those who could spring for a whole barrel of the stuff could enjoy it. F, who has been here a number of times, told us that if we only do one caves tour this trip, it should be at Moet. She was right. It’s absolutely fascinating. We learnt about the crus – or villages – and how the system of classifying grapes works. Grapes from villages designated grand crus status fetch the highest prices. Next is premiere crus. As this designation determines both grape prices and land prices, it’s strictly controlled and managed. These are without a doubt the world’s most pampered grapes. While most champagnes are a blend of grapes from different vineyards and villages, most prestige cuvees will only contain grand crus grapes. Moet’s Imperial non-vintage cuvee or blend contains grapes from both grand and premium crus. While on the subject, most champagnes are non-vintage. Vintage champagnes, such as Dom Perignon, are produced only in exceptional years. I won’t bore you with the process as such, but what really interested me is how Moet’s Imperial Cuvee tastes the same from year to year. You know when you pop that cork what you’ll be tasting. In a way, it’s a tad like the McDonalds of the champagne world. This involves a practised blending of wines – including wine held out from the previous year. There can be grapes from 100 villages in each bottle. Remarkable. Moet has 28kms of caves, with caverns within these caves holding thousands of bottles. We saw one that held 40,000 bottles. Imperial wines are kept down here for 2-3 years, and vintage wines for 7 years before they are riddled, or “turned”…a quarter turn a day. Riddlers turn 35,000 – 50,000 bottles a day. Vintage wines are still turned by hand, although the process for non-vintage is mostly mechanised these days. Following this, they are “disgorged”, have their final cork put in, are rested again for 3-6 months and then “dressed” for sale. The sommelier serving us our tasting glass at the end of the tour said that there was a Moet cork popped somewhere in the world every second. Now, there’s an image. 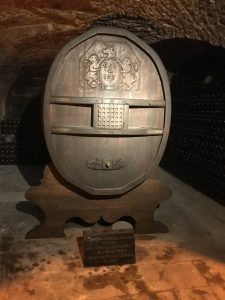 Before I leave Moet, there’s another little reminder of Napoleon deep in the caves – a barrel that was a gift from the little general. It originally contained port. Book ahead for tours which leave hourly. Moet et Chandon is, like most places in France, closed over lunch. 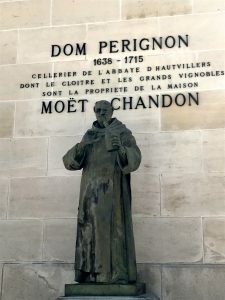 Dom Perignon was a Benedictine monk attached to the abbey at Hautvillers, a village in the hills not far from Epernay. He was tasked with overseeing the vineyard at the abbey and is credited with perfecting the methode champenoise. Much of this story is a myth. The first record of sparkling wine in France dates back at least a hundred years before old Dom was born. Even the quote above is said to have been created by advertisers in the late 19th century. Seriously though, it’s a good story, so I for one am happy not to let the facts get in the way of it. All of this leads us to Hautvillers – where Perignon died and was buried. 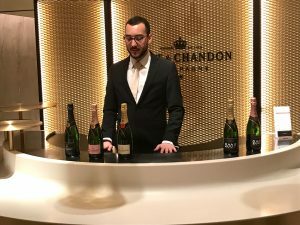 Moet et Chandon bought the land and, presumably, the story and now produce Dom Perignon, the vintage bubbles – still made largely by hand. As for the man himself? 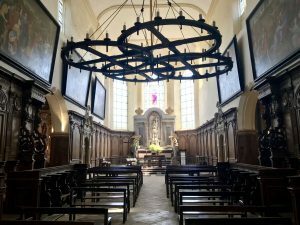 He died in 1715 and his tomb is in front of the altar in Abbaye Saint-Pierre d’Hautvillers. Is this the prettiest village in all of Champagne? I’m not sure about that, but it must come close. 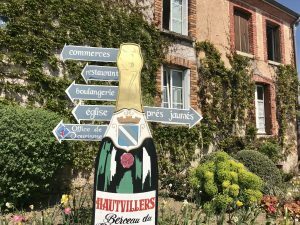 After walking up to the abbey and giving thanks to Dom, we sauntered back into town for lunch, stopping at Champagne Pierre Fedyk. The board advertised La Planche Champenoise – a plank of nibbly bits that go with champagne – for 18 euros a head. The view was free. We ended up sharing two boards between the three of us. 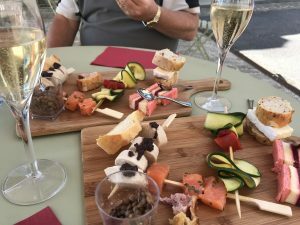 On each board were a skewer of boudin blanc (white pudding), skewers of smoked salmon, another of zucchini and peppers, a slice of pate en croute – pate in a puff pastry crust – baguette and brie, and thin slices of a local raspberry sabayon cake. All washed down with glasses of the house bubbles, it was supremely civilised. Back in the car, we headed back down the hill, past vineyards planted for Moet et Chandon, towards Sezanne. Sezanne is at the southern end of the Champagne district and was close to our accommodation for the next 2 nights in Oyes. Another medieval town, Sezanne is 40kms from Epernay and has been populated since Gallic days ie for a very long time. It has, as many of these towns do, a history that involves invasions, rebuilding, a massive fire that almost destroyed it, and some more rebuilding. It’s full of quaint, crooked, half-timbered houses that we were to see more of in Troyes. Sezanne also has possibly the weirdest looking church that we’ve seen so far – and the most interesting. The style is gothically flamboyant, yet also quite jumbled with the base of the church holding workshops that used to house boilermakers, tailors, shoemakers, notaries (lawyers) and is now home to the Tourist Office. Inside was some fabulous art and the same serenity that we’ve found in other churches so far. This one was manned by two gorgeous old ladies who were proud to show their church off and would rush to wherever we were to try and explain what was important about that part. Much of it is under restoration, but one piece stood out for me. Way up in the towers is a tiny priest walk – a semi-circle from one tower to the next. It’s impossibly narrow, exposed to the elements and way up high. If I closed my eyes I could picture someone making the dash across in a dark and stormy night. G was driving down from Lille to join us this weekend, so we were back into Sezanne for dinner at Le Flow. A blackboard menu where 2 courses were 22 euros, and 3 courses 27E, the stand-outs were the asparagus flan I had as an entree, the pretty pea veloute with a bacon foam that hubby had, and the berry bavarois we shared to finish.